The Whitewater State Park Recreational Dam and Footbridge carries a pedestrian path across the top of a dam at the north end of an artificial lake in Whitewater State Park in Elba Township, Winona County. The Whitewater State Park Recreational Dam and Footbridge is a dam that is crossed by an integrated wood beam Rustic Style pedestrian bridge. The substructure of the bridge consists of two reinforced-concrete abutments with wing walls at the ends and a reinforced-concrete pier, all of which are integrated with the dam. The abutments, wing walls and pier are faced in locally quarried, squared limestone. The bridge was designed by Skooglin and built in 1935 by the Civilian Conservation Corps. It is significant as a contributing resource within the Whitewater State Park CCC/WPA/Rustic Style Historic Resources District. Location within Whitewater State Park CCC/WPA/Rustic Style Historic Resources District. 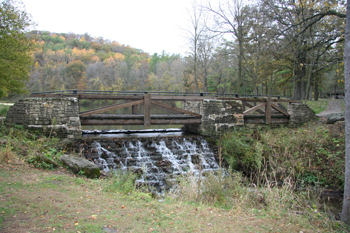 Aesthetics of Rustic style dam and bridge, including use of locally quarried, limestone masonry.